The story begins with a dinner party invitation. When young journalist Thomas Cleary is sent to dig up quotes for the obituary of a legendary film producer, the man's eccentric daughter offers him entrée into the exclusive upper echelons of Hollywood society. A small-town boy with working-class roots, Thomas is a stranger in this opulent world of private jets and sprawling mansions. Then he meets Matilda Duplaine. Matilda is a beautiful and mysterious young woman who has never left the lush Bel-Air estate where she was raised. Thomas is immediately entranced by the enigmatic girl, and the two begin a secret love affair. But what starts as an enchanted romance soon unravels a web of secrets and lies that could destroy their lives - and the lives of everyone around them - forever. 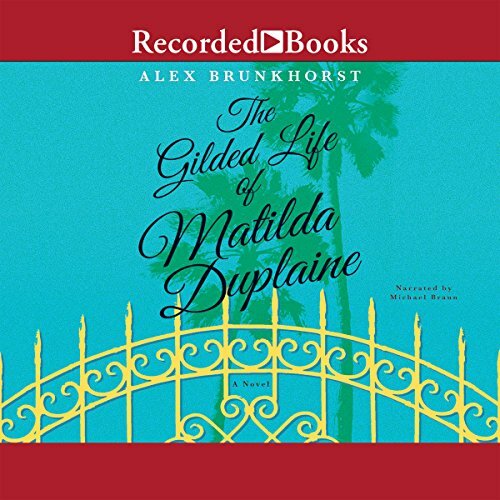 A modern-day Gatsby tale filled with unforgettable characters and charm, The Gilded Life of Matilda Duplaine is a sparkling love letter to Los Angeles and a captivating journey beyond the golden gates of its most glamorous estates. Timeless, romantic, and utterly absorbing, it is a mesmerizing tale of privilege, identity, and the difficult choices we make in the pursuit of power. Enjoyed the narrator, he seemed enthralled with the story and it's characters. While this wasn't the type of book I typically gravitate towards, it was entertaining and required no interpretation. I'm not sure what the writer wants you to get from the story. I kept waiting for something to happen that would bring the story together. There was a lot of build-up but no big reveal that would have warrant the actions or the reactions of the characters. The characters could have been interesting but they all loss any fight they have by the end. The whole book seemed like much to do about nothing. Weak story, weak narration. Disappointing in all respects. What could have been interesting is just a waste of time. Nichts an dieser Geschichte ist spannend oder innovativ. Warum die zwei Hauptfiguren sich ineinander verlieben kann man nicht so richtig nachvollziehen, es ist halt plötzlich so. Die Handlung ist so flach und linear wie in einer Soap. Man wartet die ganze Zeit auf irgendeine spannende Wende, aber die Geschichte bleibt eine Zeitverschwendung.